Shuhada Street, in the West Bank city of Hebron, has remained almost entirely closed to Palestinians for the past 21 years. While illegal Israeli settlers move freely and carry arms, Palestinian residents face an apartheid system of pedestrian only traffic, checkpoints, military closures, humiliation, arrests, and vicious attacks from Israeli settlers and soldiers. Sign the petition! Twenty-one years of closures and apartheid is long enough! Ask the US Department of Justice to use their influence and power to pressure the state of Israel to open Shuhada Street to all people. Jewish settlers began occupying Hebron shortly after its occupation by Israeli forces in June 1967. In 1994 Brooklyn born settler Baruch Goldstein opened fire in the Ibrahimi mosque, killing 29 Palestinian worshipers and injuring 125 more. Following the massacre, systems of increasingly restrictive measures for Palestinians have been implemented, including the closure of Shuhada Street. Palestinian homes on Shuhada street have had their front doors welded shut, forcing residents to climb down from neighbors' roofs or use only back doors. Patients in need of urgent medical care often wait hours while ambulances are delayed at the checkpoint. Join the Thunderclap demanding that Shuhada Street be immediately opened for all people! Each February, the nonviolent Palestinian organization, Youth Against Settlements, organizes in Hebron to protest against the measures of closure and separation in Hebron. 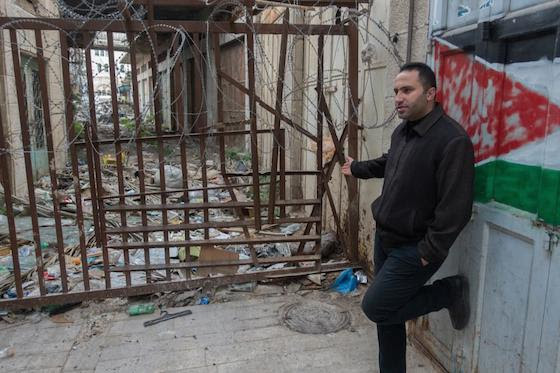 Led by recognized nonviolent human rights defender, Issa Amro, they advocate for the reopening of Shuhada Street and encourage the population of Hebron to remain in the city despite the hardships and violence they face from settlers and military occupation. Since January 6, 2016 Hebron activists and families have been staging an ongoing sit-in in front of the Shuhada Street checkpoint. Join their struggle by calling on the US Department of Justice to use their influence and power to pressure the state of Israel to open Shuhada Street to all people.